"I appreciate the older students at Sts. Peter & Paul. I noticed that they genuinely care about the younger kids, know their names and look out for them. I was quite surprised the first time I watched a Jr. High student listen attentively to my child and I've seen several others spend time with her since!" We believe that leadership is learned and we work hard at creating leadership opportunities. In a small school, there are many chances for children to lead. We elect student body officers and have an active student council with representatives elected to serve each classroom. Voting is not limited to only the older students; our youngest students are part of the process. We encourage our older students to mentor the younger students and lead by example. At the beginning of each year, the student body is divided into four "communities", with each community consisting of about twenty children representing all eight grades. We have "community" lunches, games and activities. Our 8th graders know the names of the 1st & 2nd graders and enjoy working with them. Our younger students rise to the challenge to meet the expectations of their older "community" members. Click here to read about one of the student council's many leadership opportunities. "I appreciate the school families that form with kids of each grade. This is a great mentoring program!" at Mass to more than a hundred people and they all seem comfortable with it. That experience is hard to get anywhere else." Learning to speak in public is a necessary skill for a leader. Beginning in first grade, our students are required to read over the microphone at Mass, speak and act in plays, and give religious, science & history presentations to parents. By the eighth grade, most are extremely comfortable in front of an audience. 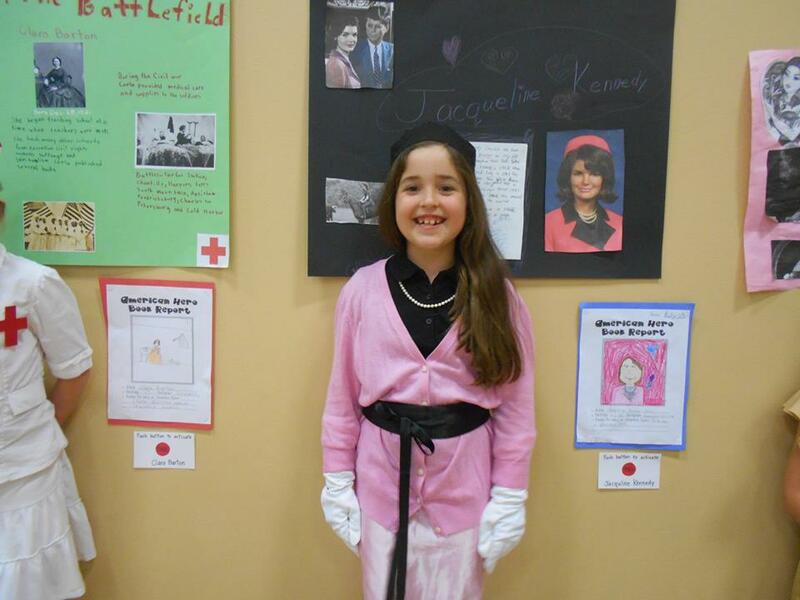 One of our favorite ways to teach public speaking is with our Living History Museum presentations. Characters are "activated" when museum-goers push the red button beside them. We've gotten to meet presidents, scientists and inventors, country founders, astronauts, first ladies and average workers. The quote says it all. Treasure notes encourage students to recognize the goodness in each other. Positive reinforcement is a core value of the school. "I appreciate the volunteers who agree to chair events -- devoting their time for the financial sustainability of our school." Sts. Peter & Paul School demands a high level of parental involvement in the daily operations of the school. We believe that education starts at home, and an education without parental involvement is not a complete education. Our parents are our greatest resource and we welcome them. We are flexible and work to provide opportunities to our students based on the interests and talents of our parents. We have altered our curriculum to include some Spanish lessons by one of our Hispanic parents, had various parent artists teach, learned about how grain elevators operated based upon a working replica built by a parent, and even had an impressive safety demonstration from a parent who is a lineman. We appreciate and utilize the wealth of knowledge & experience parents bring to our school. "I appreciate the school dances. When I came to this school, I was pretty skeptical that a dance could be held for 1st through 8th graders and work. But they do!! The older kids come to the dances and have so much fun. They act like they really want the younger kids there." Because of the good integration between all eight grades, our dances for the whole student body are greatly anticipated and well attended. The dances have themes chosen by our student council and emphasize FUN!! Our students line dance, participate in Western Swing dance competitions, laugh during the chicken dance and they greatly enjoy the "snowballs" where it's a regular sight to see older kids pulling our littlest students out on the floor. "I appreciate that the older children choose to dance with the younger kids during snowballs at the dances. If the snowball starts with all older kids, they don't choose the younger kids last." If there is enough interest, students may start a club of their choosing and we help them work out a time for the club to meet at the school. 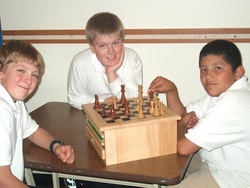 One year, students formed a chess club. They invited some adults to teach chess skills, but most of their time was spent playing the game. "I appreciate that 6-8 graders can take band." Because we cannot offer a band program, we make time in the school day to allow any student in grades six through eight to attend band classes at GEMS. Many of our families take advantage of this. Those students who do not wish to take band are offered other options such as a study hall or working on our yearbook or newsletter articles.